Dreamweaver: Hiddlestoned! And loving it. It began when Thor was released and by the looks of, it seems like it's going to last a lifetime. Let me explain. As a person, I'm not really fan material. This may be hard to believe, but I've never really adored a celebrity enough to become a fan. The closest I came to being a fan was with Johnny Depp - an actor I truly deeply admire, for his blatant love of eccentricity. But that's just admiration and deep respect for a fellow eccentric and brilliant actor - it's nowhere near fandom. So when Hiddlemania hit me, it took me by serious surprise. If I thought I could be immune to the blue-eyed charms of a tall, gentlemanly, talented British actor, I was mistaken. It hit me hard and like all other Tom Hiddleston fans, I fell. Head over heels. Lock stock and absolute barrel. With buckled knees and twisted heart. It's like any other addiction - you just keep wanting more. The only difference is that unlike cocaine or glue sniffing, this one addiction may not be bad at all. It may even bring out some dormant poetry inside of me. It may inspire me enough to write more and find more beauty in life (trying not to get too dramatic). Who knows? Hm. So I asked myself, "What is it about this man that's got you into such a fuddled state of mind, Shreyasi?" Well, it would be really simple, if there was just one thing. But the man is a walking talking enigma. How does one quantify an enigma? I'll try anyway. He's gorgeous. At a towering six feet two inches, he's what they call...well tall. He's really tall and lean and lithe, thanks to all the running he does. A lot of people don't find him conventionally handsome. That's fine by me. To me, he's one of the handsomest men in Tinseltown. And the rest of the world for that matter. His smile is a killer. It's the widest, most open-toothed, honest, from-the-heart smile I've ever seen anybody wear. There's nothing fake about it. And that's a difficult trait to find in people today. However, it was not his smile that first took my breath away. It was his big baby blue, super expressive eyes. I think I swooned when I first saw him look at Odin and scream out " TELL ME !!!" and in the next moment switch to a soft "Why? because I'm the monster that people tell their children about at night?" oh my my. I could reach into the movie screen and hug him tight. Hugging. That's another thing. He wears his heart on his sleeve and expression is second nature to him. He loves hugging people and that's justifiably got him another nickname- huddleston or simply huddles. I know of fans who are roaming the planet as we speak, thirsting for a huddle. I wish them all the luck, because I may very well be joining them soon. Moving on, he is as suave and polished as one can get. His perfect British words in the perfect British accent, are measured and well delivered, not just on screen, but on red carpets, at interviews, whenever. That, coupled with his smooth-as-silk voice, is enough to make you think you've died and gone to heaven, until the harsh reality of life breaks in on you again. I mean have you guys heard the audiobook "The Red Necklace" read by Tom recently? Pffffffttt...I hesitate to buy the blasted thing, because if listen to him speak, I may just collapse in sheer bliss and never wake up again. Sigh. Such is life. I've heard people say, "Well, he had it made from the beginning. He was born with a silver spoon in his mouth and there's nothing great about what he achieved. Well, I think they're wrong (and I tell them just as much). It's one thing to be born into a rich family and live off familial glory. It's a whole other ball game, to plod on, irrespective of the circumstances of your birth, to live in utter humility, work hard and earn a name for yourself. Tom did just that. And at a ridiculously young age too. You don't get into Eton with the flick of Daddy's magic wand. You don't earn a double first at Cambridge just coz your dads rich. You don't get to study at RADA and come out like a shining star, just coz your family has a lot of extra cash lying around. You don't get lead roles in blockbuster movies coz you look cute. You don't get nominated and awarded for your patent leather jackets and stylish shoes. You don't have a humongous fan following worldwide, because you're pretty. Tom just proved to the world that he deserves every accolade that is due to him. He runs. He acts. He's a gentleman. The kind that would inevitably open doors and pull chairs out for a lady. Gentlemanly chivalry shows in every nuance and effervescent humility leaks out from every Hiddle pore. He laughs like his life depended on it. He talks with his sky blue eyes and he can lull someone to sleep with his soft velvety voice. He is a brilliant actor and he has proven it on more than one occasion. He's versatile, stylish, positive, confident, content with who he is and most importantly, he seems to be happy within. He's got the world talking about him and he doesn't let that kind of fame get to his head. He respects people of all races and he adores his fans. What more can I say? I recently had a fangirl moment. I came to know that Tom's sister Sarah is a reporter, currently living in Chennai, India. At this juncture, I'd like to announce that I'm Indian and when I came to know that Tom had already visited his sister four times in India (effectively making Chennai a much hotter place than it already is), I went 'whopppeeeeee!!!!' my heart did a triple flip, I sighed really loud, five times (I remember because my dog gave me some rather surreptitious glances) and I almost felt dizzy wondering how it would be, when I would go to Chennai all dolled up and just 'happen' to bump into him. Yes yes, I know there are a billion Indians worldwide and I'm just a speck in that ocean. Yet, the heart likes to hope. I have seen his movies and acquired a few of them as well, for my collection. I've seen all his interviews. I have a ton of his pictures and I've got a whole slideshow thing going on my office desktop, so that I can work and gawk at him at the same time. I've seen videos of him compiled by fans, with awesome background scores. I read his Twitter updates and I'm a part of a Facebook fan page. And recently a group of kind hearted fans, who aptly call themselves the Hiddlestoners, agreed to let me into their fold as well. I am now officially a Hiddlestoner myself. I thank them from the bottom of my heart. My friends and colleagues laugh at my obsession with Loki coz he's the bad guy and the natural thing to do, would be to go woozy about the man with the hammer. My parents worry about my fuzzy brain. My husband accepts my craziness and when I go into one of my insane Hiddlemaniac modes, he ignores me as best as he can. But I have finally found an answer to the long-asked question,"If you were alone on an island and could have just one person with you, who would it be?" Am I just another Hiddle-crazed fan? Hell yeah! Am I ashamed to be one? Hell no! Onward Tom! I'm Hiddlestoned! And loving it! I love this! I've been thinking about writing something like this too, but it seems as though you wrote it for me. Thank you for letting me know that there is a majorly talented writer out there who thinks exactly like I do, but can put words across a bit better. I share your feelings for Loki :-) never seen myself swoon over a character villain before...but then there's a first time for everything! He is such a brilliant actor...thank you putting it in words for fans comme nous! p.s. You write beautifully! AWWWW mili thanks a ton! Yes i have been swooning over Loki ever since I saw him...and then I started swooning over Tom himself. Im such a freaking swooner :-) Ive been Loki'd! 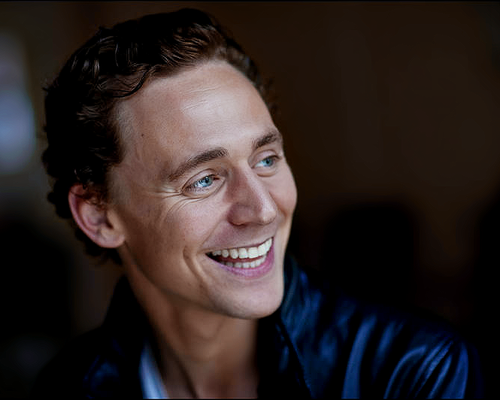 :-)Join the group Hiddlestoners on FB...theyre great! sure he will love it!! Plus please publish your own book real soon! You are indeed a true blue fan Shreyasi!!! :)) n reading your piece , I almost flipped for the guy myself ! :P Your writing is so convincing!!! :) love it! !